Who wants to play the What's in Your Purse Mommy Game? Women love this baby shower party purse game. Points are given for each item found in a lady’s purse from the obvious to the plain weird! So all the ladies with crammed purses this game is for them. 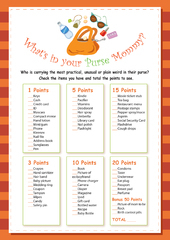 Hand each player a game sheet and ask that they tick each item found in their purses. Players can exchange game cards to tally scores and the player with the most points wins! This is a printable game YOU print at home or your favorite print shop. Game is 8 1/2" x 11" and will come in PDF format. There will be a download link after your order is placed. Print on paper or cardstock. No Shipping Cost and print as many as you need. Check out our website for more baby shower games and free printables for your baby shower party! Copyright © Fub-BabyShower-Games.com. All Rights Reserved. Add item to your cart. Make payment through PayPal. You will be directed there automatically when you submit your order. You will receive your file via the email. Please make sure that you still have access to that email. Any form of redistribution of Fun-BabyShower-Games.com printable files is a violation of my terms and copyright infringement. You may not alter the files in any way and reuse/resell them in whole or in part. Personal use only. Have any questions? Contact Me Or visit our FAQ’s Page.